Dean Baker has a piece in the Democracy Journal where he argues that we need to change the rules of the market to ensure that market income — the labor and capital income paid to workers and investors — is distributed more evenly. I agree of course with Baker that we should take steps to compress the distribution of market income. But I think his treatment of this issue greatly overstates how egalitarian market outcomes can be and, relatedly, misses how crucial a big welfare state is to achieving low inequality. The standard liberal approach to economic policy is to support government programs that counteract the inequities generated by the market. Unfortunately, this narrow focus on government programs has effectively given the right free rein to restructure the market to redistribute an ever-larger share of income to the rich and very rich. 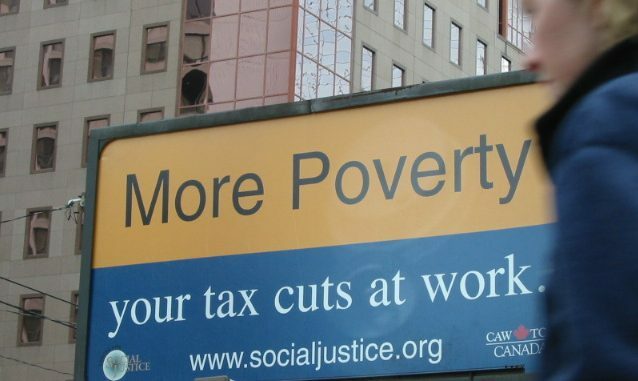 While tax and transfer policies are important, if liberals had not ignored, or in many cases supported, the ways in which the right was restructuring the market, the existing levels of poverty and inequality that the government needs to address would be far lower. This is because the idea that the extremes of wealth and poverty we see are inherent outcomes of the market is wrong. there is nothing inherent to the market that causes it to generate at once both poverty and extreme wealth. This is a common argument you see from some folks. They say that the welfare state merely gives back to the poor what the rich took from them in the first instance and that we could really solve the problem at the source by cramming down the distribution of labor and capital incomes. This sounds good, but it’s mostly wrong. The reason the welfare state is so key is that the market only distributes to labor and capital, but a large swath of the population is neither a worker nor an owner. We’re talking children, elderly, disabled, students, caregivers, and the unemployed. Together these nonworkers make up around half of the population and their market income will always be $0. The welfare state is the only way to get these people income and it is getting these people welfare income that creates a low-inequality, low-poverty society. What Does Compressing Market Income Accomplish? To make the distribution of market income more equal, you basically need to do two things. First, you reduce the share of income going to capital and increase the share of income going to labor. Since capital ownership is heavily concentrated among the rich, this cuts down on inequality. Second, you reduce the share of labor income going to high-earners and increase the share going to low-earners and middle-earners. These two moves shift income down the ladder somewhat and it is easy to see how someone might therefore start thinking that this sort of redistribution (or “predistribution”) would largely solve the problem of inequality and poverty if it was taken far enough. But in reality it wouldn’t actually do that much and certainly not as much as a genuine social democratic welfare state would do. If you ignore all the nonworkers in society, inequality falls a lot from this sort of thing, but if you bring them into the picture, you see pretty quickly that efforts to compress market income are largely pushing on a string. Consider the case of two hypothetical families. One is a young couple with three kids and both members of the couple make the 10th percentile wage. Another is an old couple who are empty nesters with both of them making the 90th percentile wage. Suppose that, in the status quo, the 90th percentile wage is 5x the 10th percentile wage. But after a radical predistributive agenda, that ratio drops to 2.5x. This looks impressive. The wage gap was cut in half! But there is still an incredible amount of inequality between these two families because the young couple not only makes 60 percent less than the old couple, but also has to spread that amount across themselves and their three kids. If you adjust for family size, the old couple still has 6.25x as much market income as the young couple. Even this hypothetical is generous to Baker’s approach because it compares two dual-earner families. But in real life, there are a lot of single-earner families and even many zero-earner families, such as those headed by disabled people, elderly people, or unemployed people. For them, market income compression does even less to bring them closer to families who currently have high market incomes. Compressing market incomes is great, but since around half of the population doesn’t receive any significant market income, all market income distributions are going to create hideous inequality and poverty. It is not just hypothetical families that demonstrate this. We can also look at real-life societies. The Nordic countries have a much more compressed distribution of market income than the US has. Most notably, their wage distributions are way more egalitarian than wage distributions in the US. The 90th percentile earner in the US makes about 5x what the 10th percentile earner does. In Sweden, it’s 2.3x. And yet, when you measure income inequality and poverty in these countries based solely on market income, the results are better than the US but still not that impressive. It is only when we look at disposable income — market income plus welfare income minus taxes — that you see really egalitarian outcomes. Here is the overall level of income inequality as measured by the Gini coefficient. The red bars show market income inequality. The black show disposable income inequality. Here is the poverty rate. Once again, red shows the market income poverty rate and black shows the disposable income poverty rate. However, the political obstacles to very large-scale tax and transfer policy are probably even greater. There is a deep suspicion of government among large sectors of the electorate. To some extent, this is tied in with racism and classist ideas of the lazy poor reveling in government largesse. But the origins do not really matter: It is politically very difficult to obtain public support for large-scale tax and transfer programs. But while the welfare state approach might be politically difficult, the market income compression approach is simply not up to the task. Such compression is a good idea worth striving for and it will for sure cut down on inequality some. But if that’s all we can hope to accomplish, then the US is going to be an inegalitarian hellscape forever.